Somehow I’ve missed adding a rain boot to my footwear collection. I’m not even sure how I’ve gone so long without having one…they are a perfect fall staple! After mulling through tons of styles, I’ve narrowed it down to a strong top ten! I am basically obsessed with almost every Burberry style that Nordstrom has to offer. The mid-calf (one & two) are currently the top contenders. What you think? Number eight are specially gorgeous! I Love number 1 pair. I am so fascinated with the studs right now. 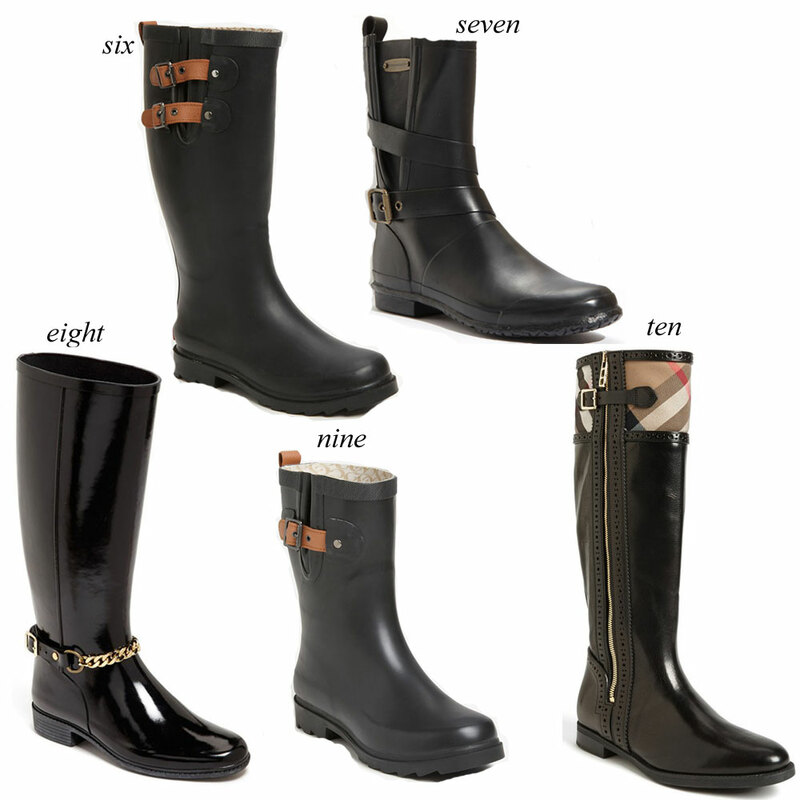 They have such an edgy look for a rainboot..
I’m loving number seven, I love the open side. Thanks for the post, I’m moving to Portland next year so I’m in the rainboot market too! Great post! I wear similar boots to number one in my latest outfit post..
Love #5 and 10! Cute! I love living in a world that has trendy rain boots! Especially when you live in a city where you NEED them ie. Vancouver. Great finds! Loving all these picks! 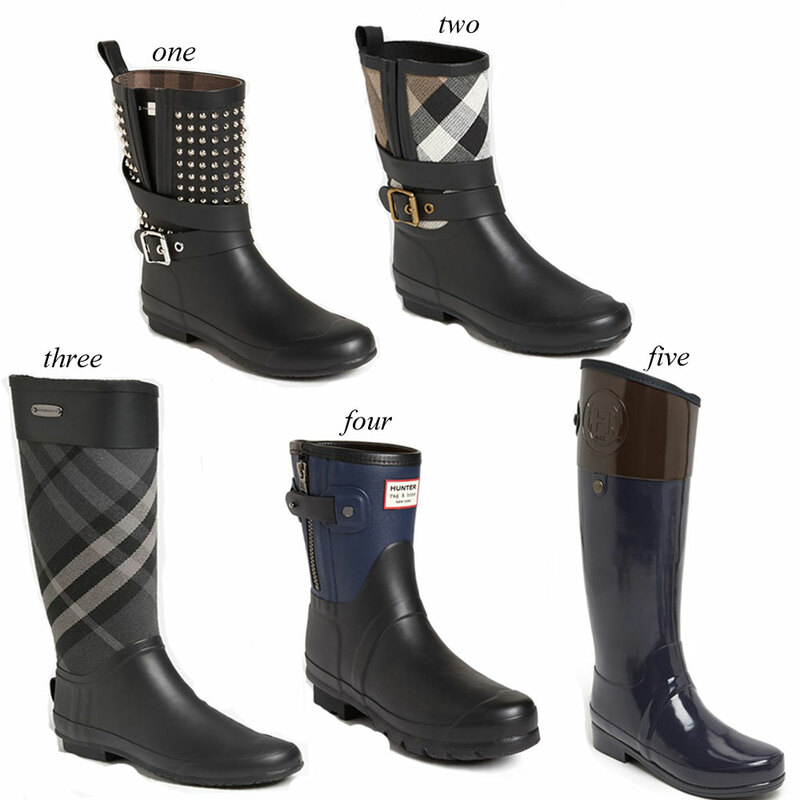 Rain boots are amazing and I love how different all of them look, just so fashionable! I suggest the Aigle Miss Juliette Satin Rainboots. $165 and very comfortable, plus far better looking than Hunters. #4, so perfect for the northeastern winter! Obsessed with 1 and 8! Love!! I love ALL of those boots, especially number 8. I love that its Fall season because its not too hot nor is it too cold. I love that I get to bring out my fall clothing and accessories especially my BearPaw boots. I always buy my BearPaws from this cute boutique store a friend told me about. You can check them out on http://www.shoedaca.com . These are a pair of boots I bought this fall and are beyond comfortable. I almost wear them with everything because I can wear them all day without my feet hurting. Women’s Rub 1 Rain Boot, availabe at Amazon.com? Love the red ones!